Switching to only neutral, sunset tones come fall is like eating dry toast every morning (yawn). Just because fall isn’t usually associated with bold, bright hues doesn’t mean you need to wear all black everything from now until the end of winter. In fact, this season the stores are packed with eye-popping hues that will brighten your days, especially as they get shorter and darker over the next few months. Whether you wear one standout shade or mix fall’s hottest colours for a fashion-forward look, these picks were made for turning over a stylish new leaf. 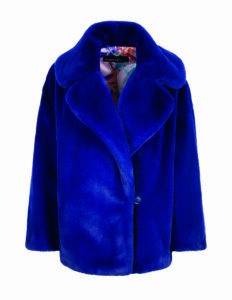 Faux fur is having a fashion moment, and in the 2018 colour of the year, this jacket could not be more on point. A head-turning pick that’s sure to stand out in a sea of gray and black, this vibrant topper is guaranteed to make you feel warm and fuzzy with every wear. Marc Cain jacket, available at Andrews. 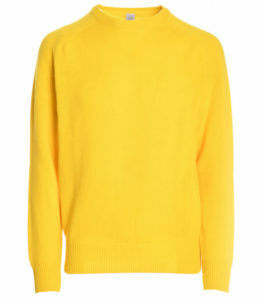 Easily the season’s most eye-catching shade, a bright yellow sweater is guaranteed to put a positive spin on your wardrobe. If you usually skip over the shade because you find it unflattering, consider wearing a collared shirt underneath that better complements your skin tone. Wouldn’t it be nice to wear the shoes you want, whatever the forecast? A practical pick that will keep you colourfully on trend, these galoshes will protect your favourite footwear once the inclement weather sets in. 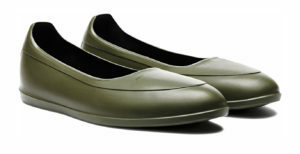 Mens’ swims galoshes, available at Jean-Paul Fortin. 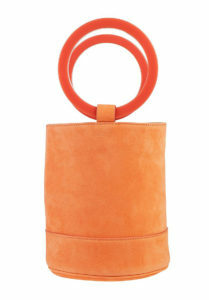 Add a pop of colour to any outfit with an artful orange purse. Handmade by Italian artisans and fit with a detachable strap, this bright little bag will liven up your neutrals and fare just as well when styled with shades of purple and blue. Simon Miller purse, available at TNT. A stunning choice in blouse or sweater form, lilac will look equally nice as your next manicure shade. Pretty enough to make a statement but still a subtle way to work the colour trend, this polish is the perfect alternative to your fallback pinks and nudes. Essie Nail Polish in Lilacism, available at Rexall. There’s no denying the fierce fashion appeal of this iconic shade. 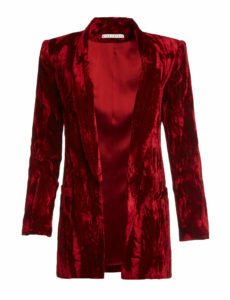 While a bold red lip would certainly do the trick, this crushed velvet blazer is a knockout choice you can wear to heat up your go-to LBDs or dress up a jeans-and-tee look. Alice + Olivia blazer, available at Andrews. From scaling the corporate ladder to sitting down for a fancy dinner, this long-sleeve blouse has you tastefully covered. Pair the float-y fit with streamlined pants or a pencil skirt, and leave any jackets you wear overtop undone to show off the delicate ruching and discreet keyhole slit. 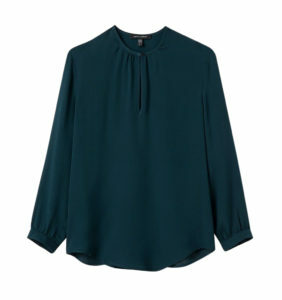 Blouse, available at Judith & Charles.